So first up I have to admit that I didn’t do anything exciting with the lettuce, cucumber and 1 of the tomatoes, those were turned into fillings for burgers and salads throughout the week. 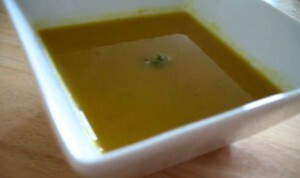 I used all the carrots and one onion for a wonderfully simple carrot and coriander soup. I have to admit I have a soft spot for spicy foods, and coriander (or cilantro, for those in the Americas) takes what would be a fairly boring carrot soup and makes it pop. However Carrot and Coriander soup is fairly common in these parts, so maybe not quite fulfilling the spirit of my challenge. 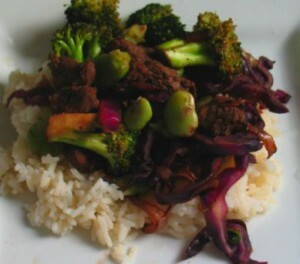 Next up I created Broad Bean, Cauliflower and Broad Bean Stir-fry, which is a little bit more on the adventurous side. But then again I have made a million stir-fries before, but this one was different because the colours were so striking. 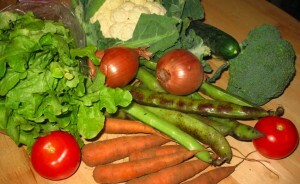 So far I haven’t really done anything truly amazing with the veg in my box, but there is one last recipe to come. Cauliflower Curry. Admittedly Cauliflower anything doesn’t sound like it is going to set the culinary world alight, but there is a lot more to a dish than a name. The problem with Cauliflower, as with a lot of vegetables, is that it’s a vegetable that has been relegated to an overcooked side dish, smothered in cheese sauce. While I love cauliflower cheese as much as anyone, it isn’t the cauliflower that makes that dish – it’s always the cheese. The subtly of flavour can’t get through that dense cheesy flavour, and at most times cauliflower cheese could be made with almost any other vegetable and you wouldn’t care. 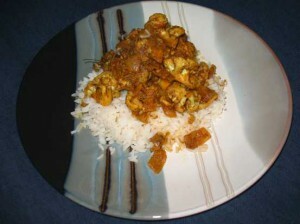 However in this cauliflower curry the flavours complement each other. As a curry-lover it is slightly strange that I don’t have more posts (or any) on one of my favourite meals, but in time they will come. (i.e. I am in the process of writing up the Cauliflower Curry) In the meantime you can take a look at the recipe that inspired me – Priya’s Kitchen: Cauliflower Curry. Next weeks round up will include more Beetroot, more cabbage and mushrooms. Any ideas gratefully received!